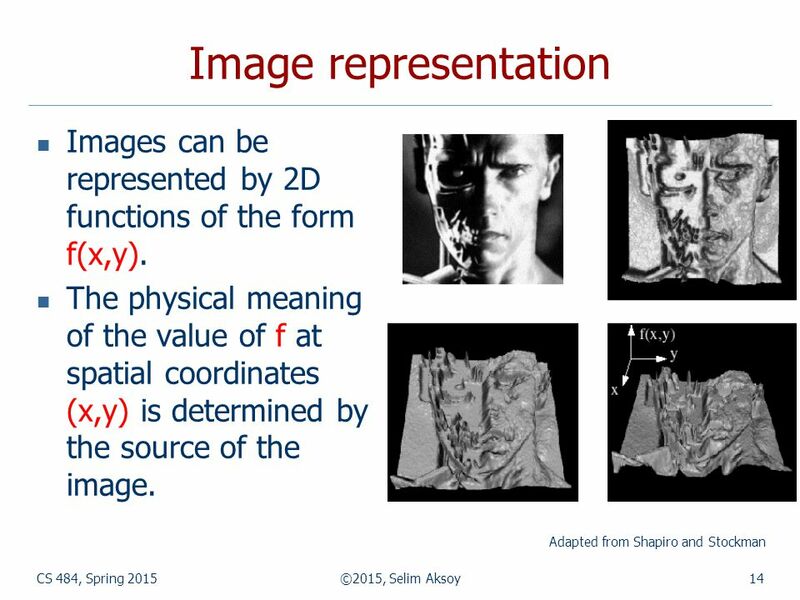 15 CS 484, Spring 2015©2015, Selim Aksoy15 Image representation In a digital image, both the coordinates and the image value become discrete quantities. 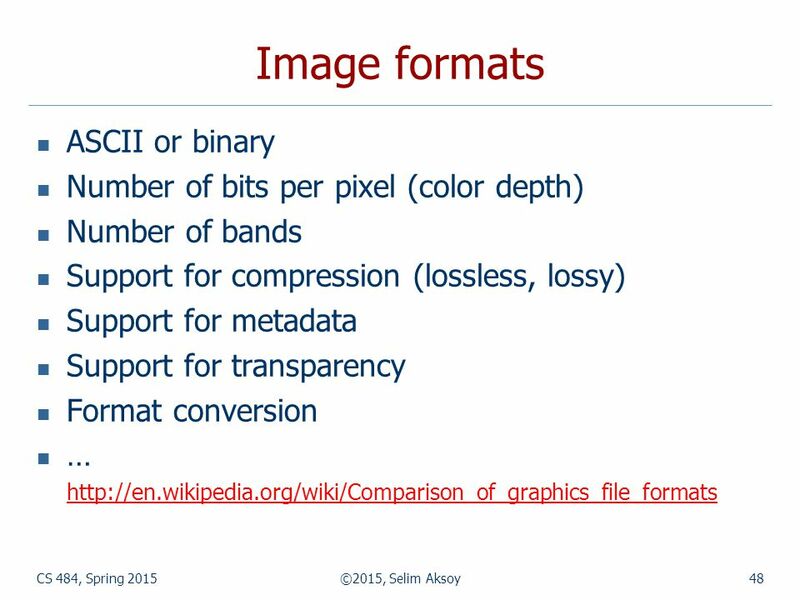 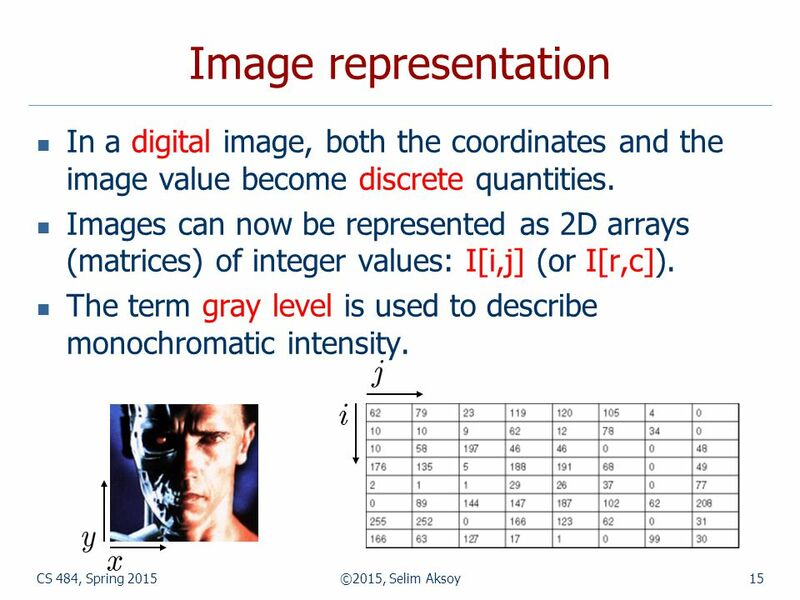 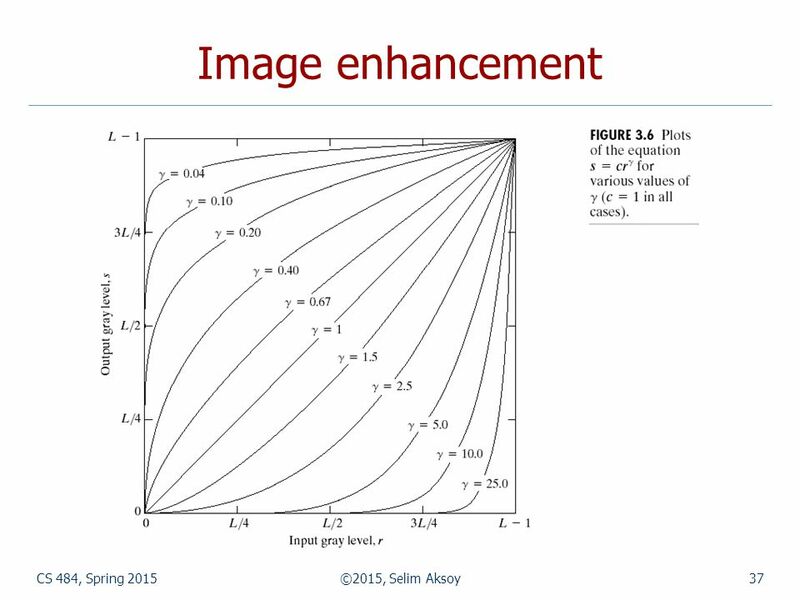 Images can now be represented as 2D arrays (matrices) of integer values: I[i,j] (or I[r,c]). 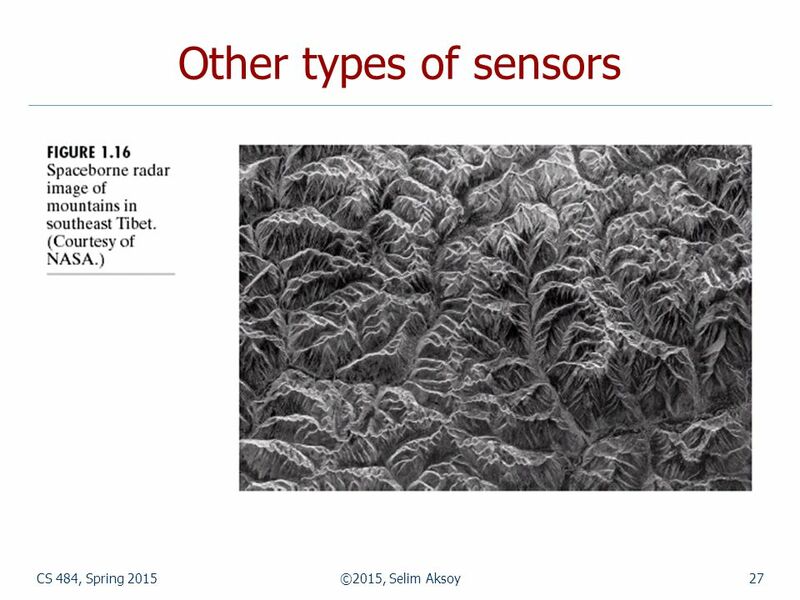 The term gray level is used to describe monochromatic intensity. 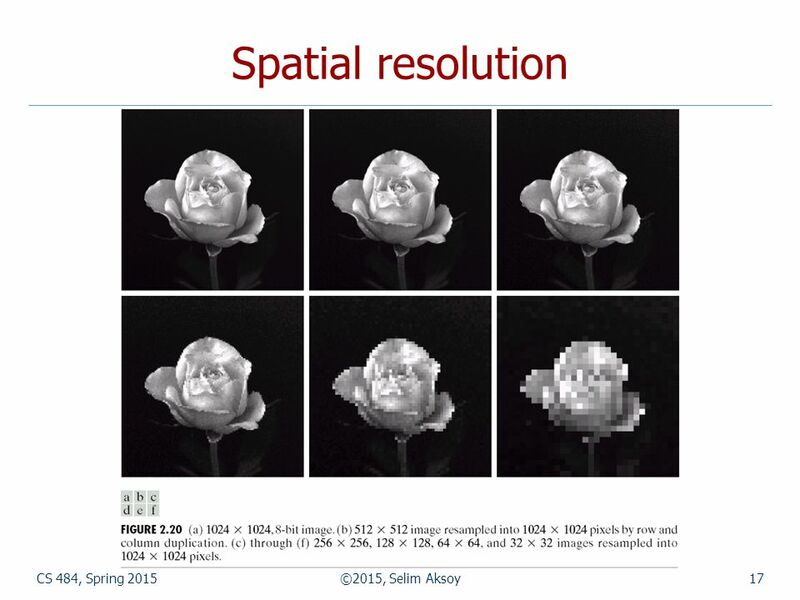 16 CS 484, Spring 2015©2015, Selim Aksoy16 Spatial resolution Spatial resolution is the smallest discernible detail in an image. 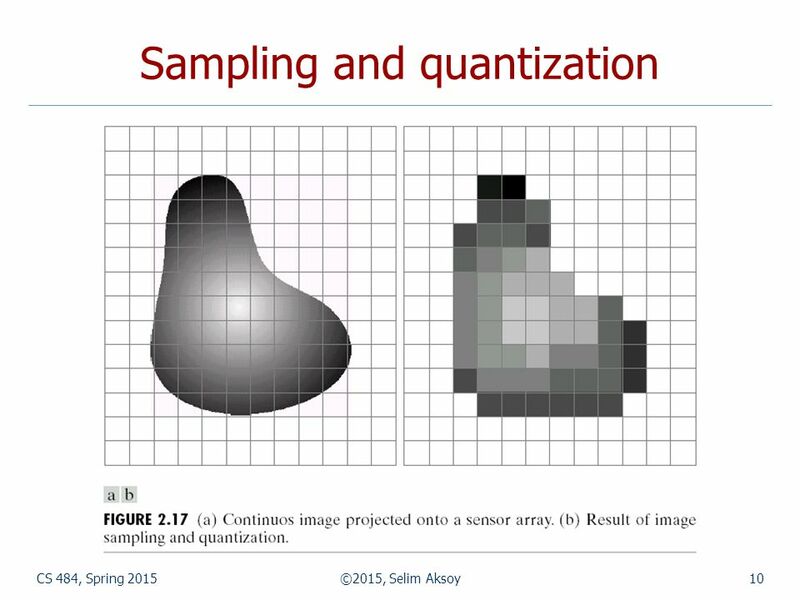 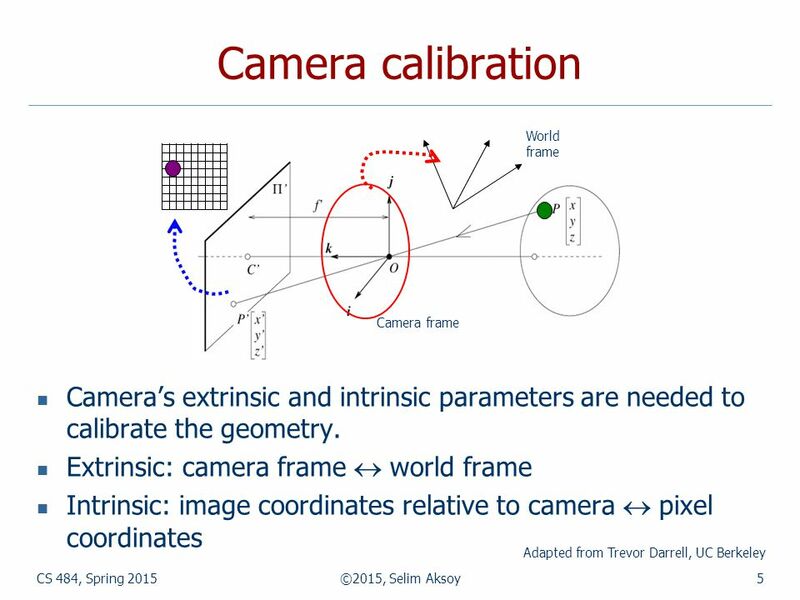 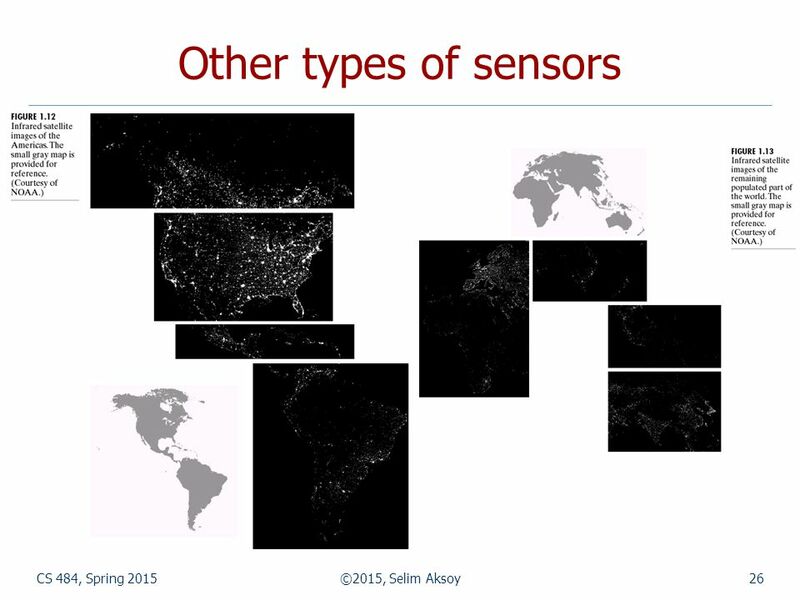 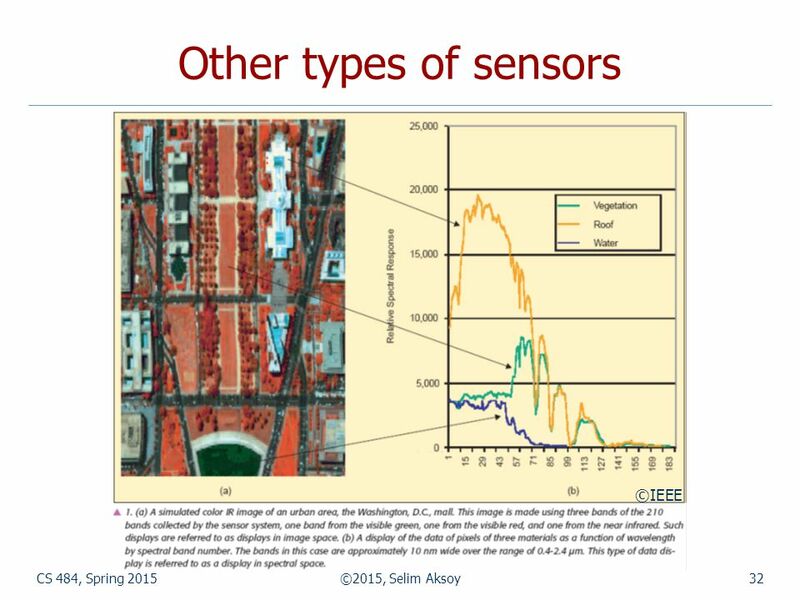 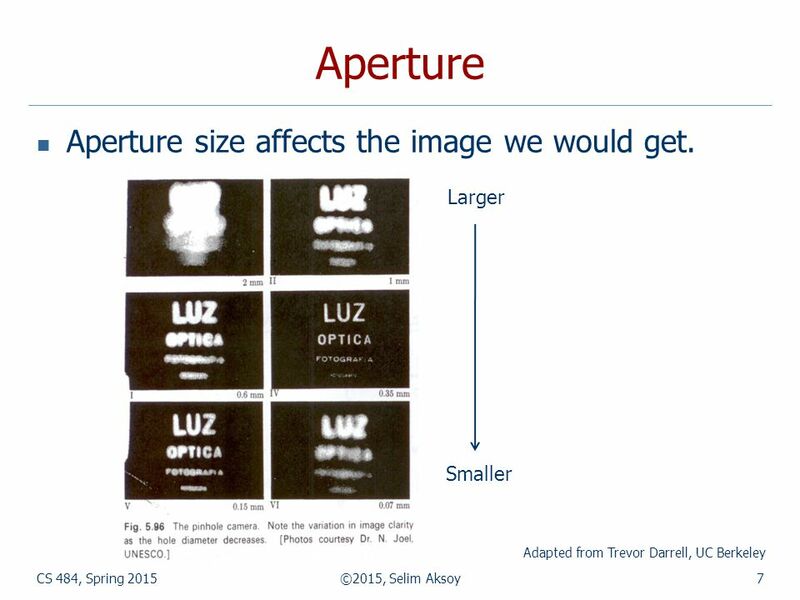 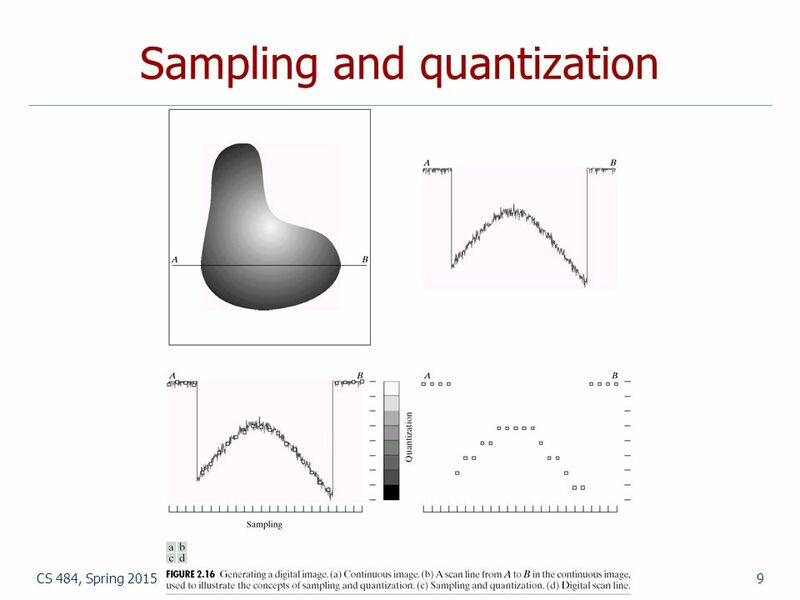 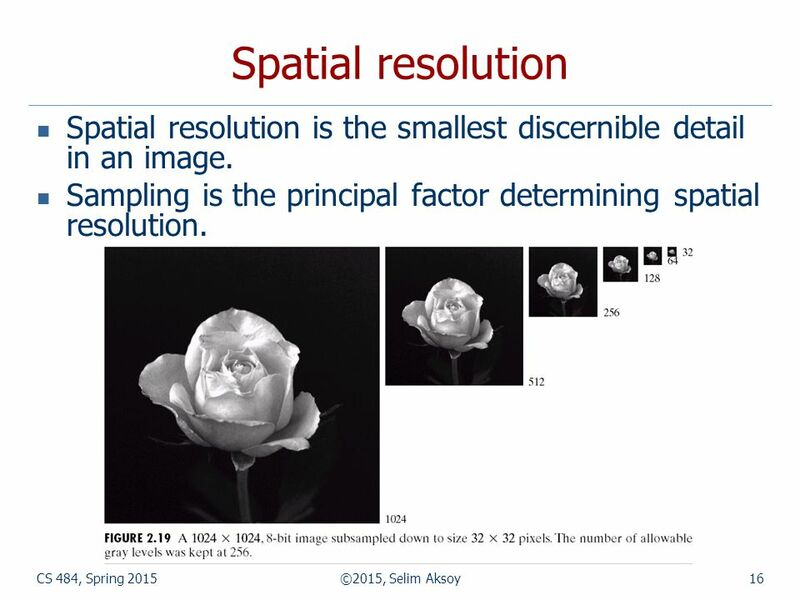 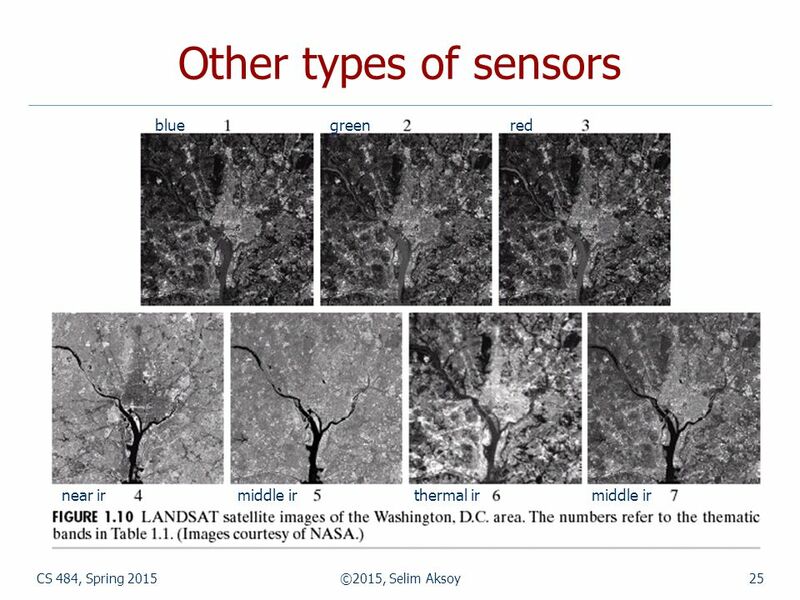 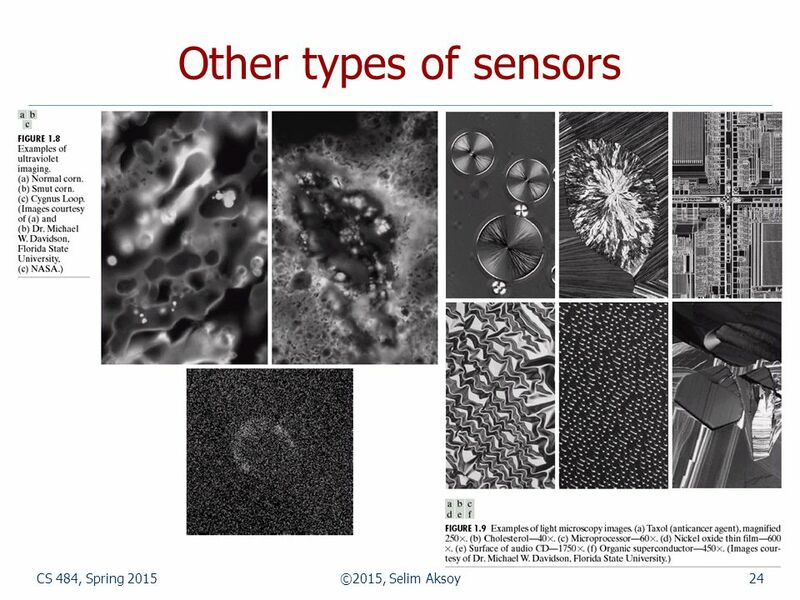 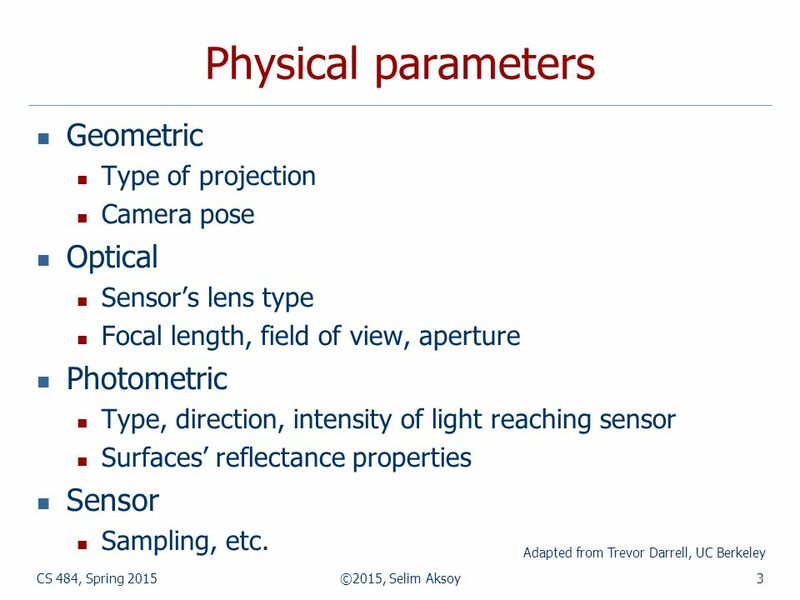 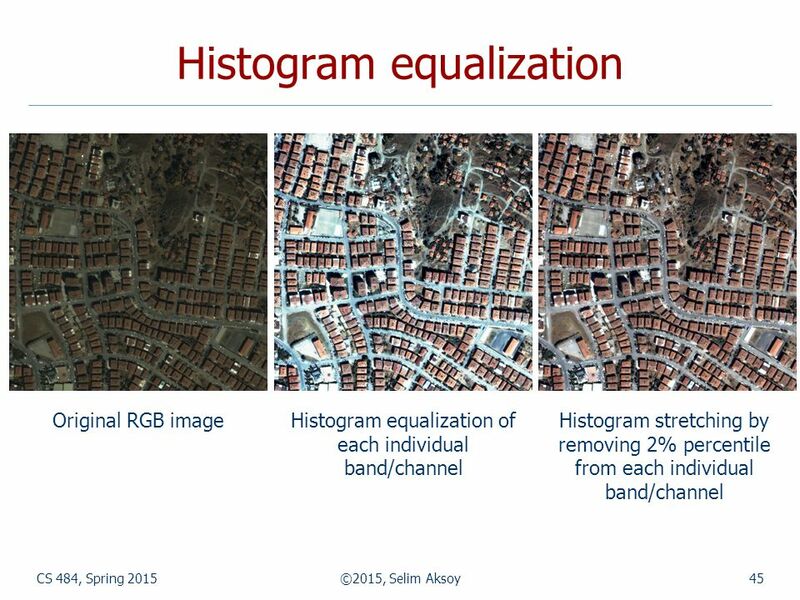 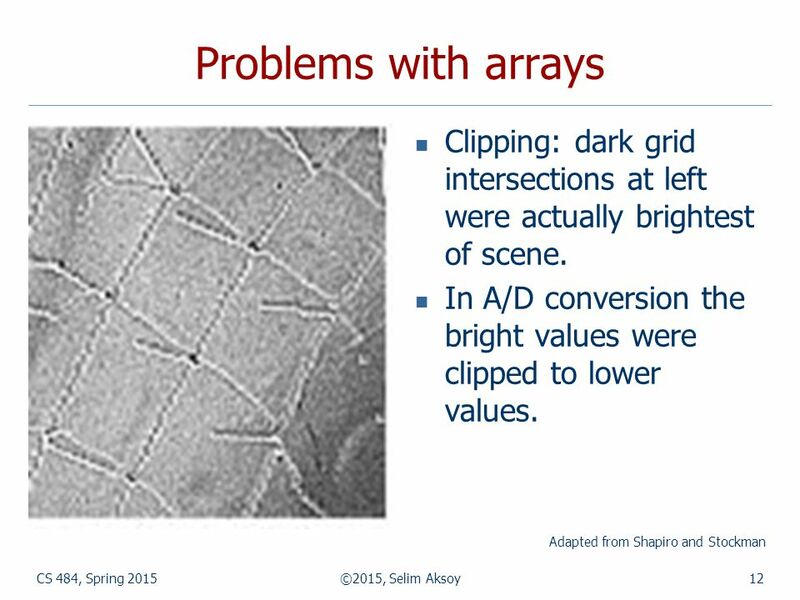 Sampling is the principal factor determining spatial resolution. 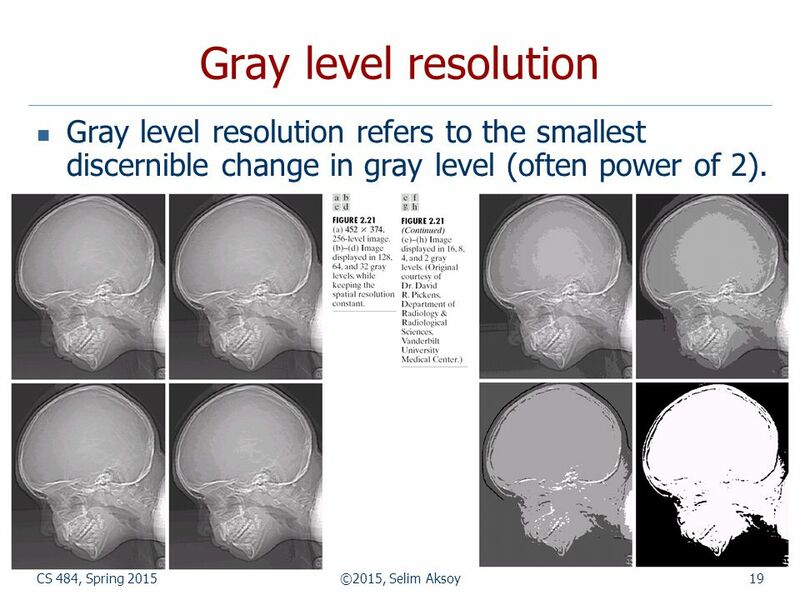 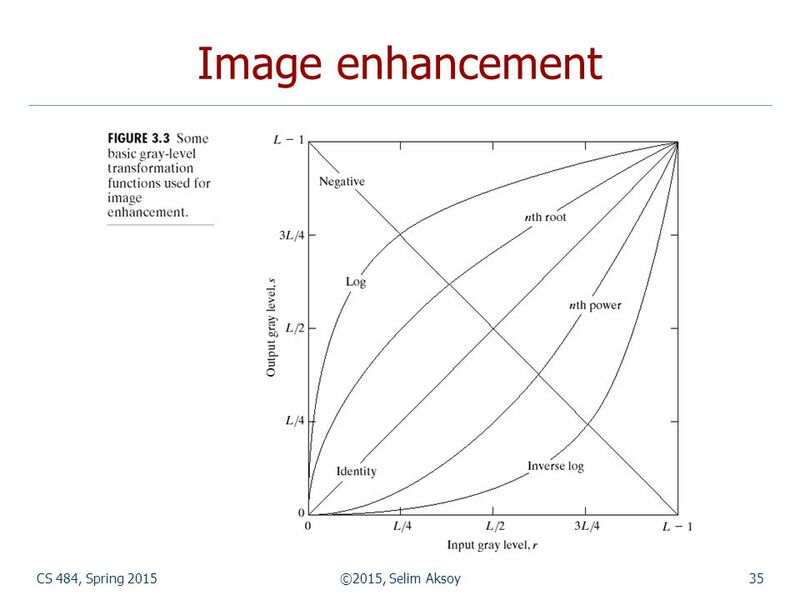 19 CS 484, Spring 2015©2015, Selim Aksoy19 Gray level resolution Gray level resolution refers to the smallest discernible change in gray level (often power of 2). 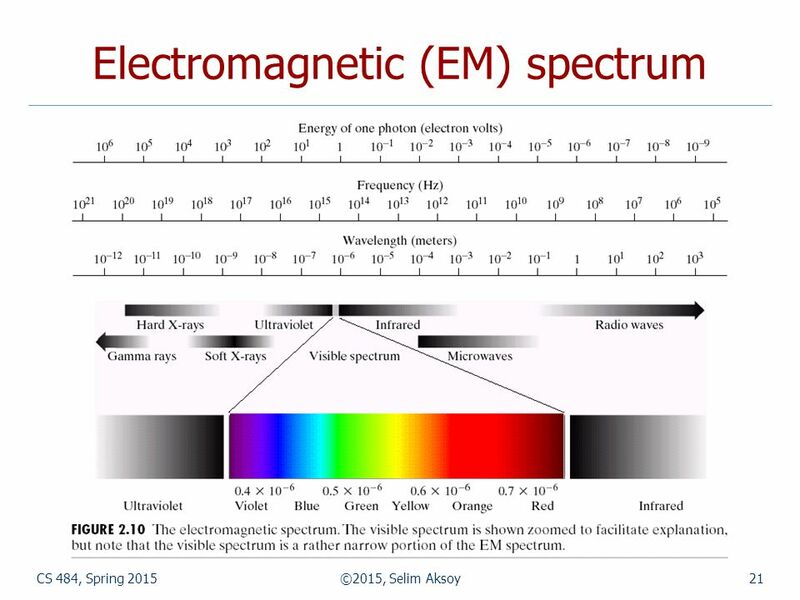 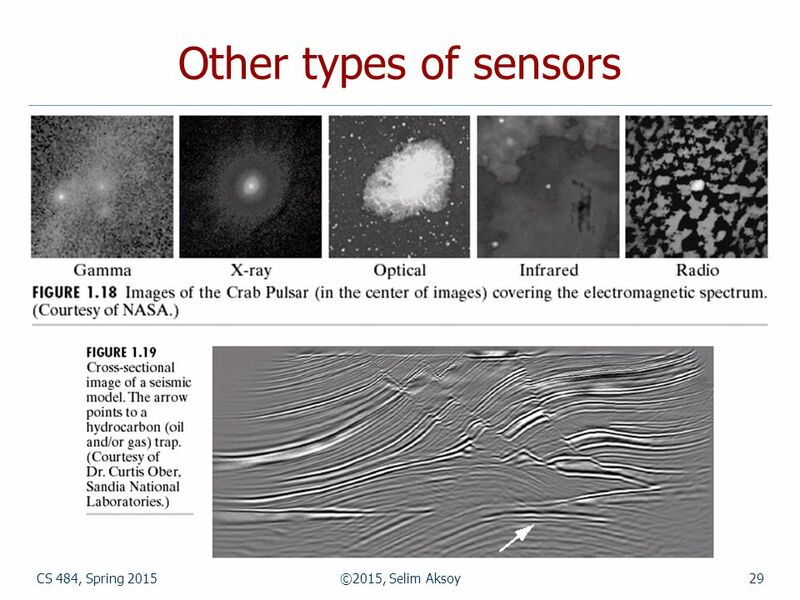 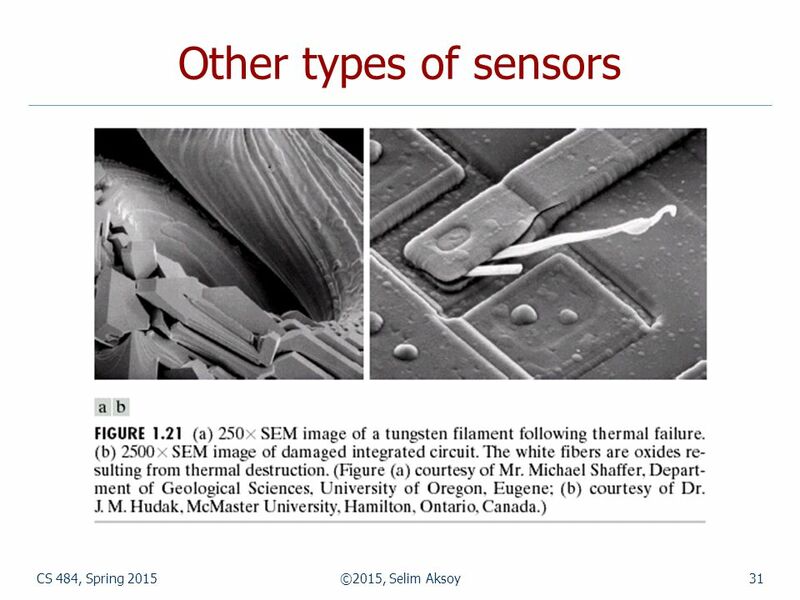 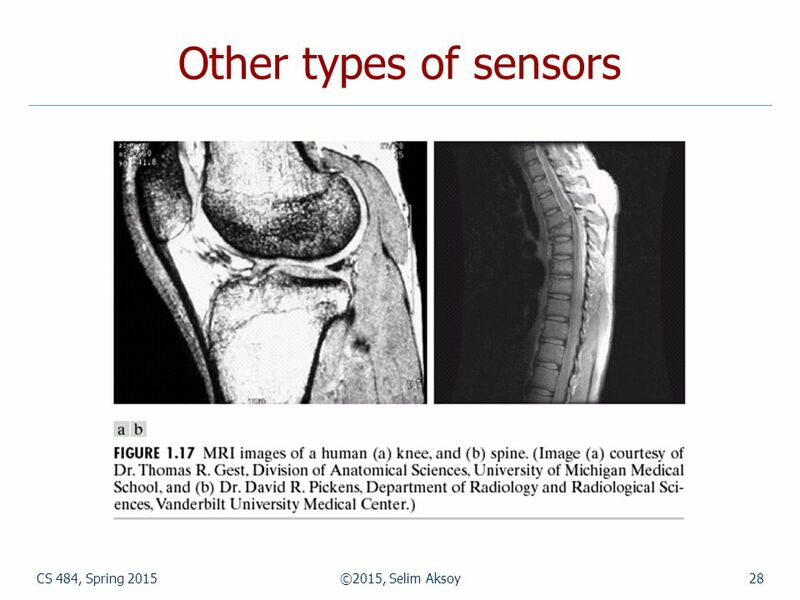 22 CS 484, Spring 2015©2015, Selim Aksoy22 Electromagnetic (EM) spectrum The wavelength of an EM wave required to “see” an object must be of the same size as or smaller than the object. 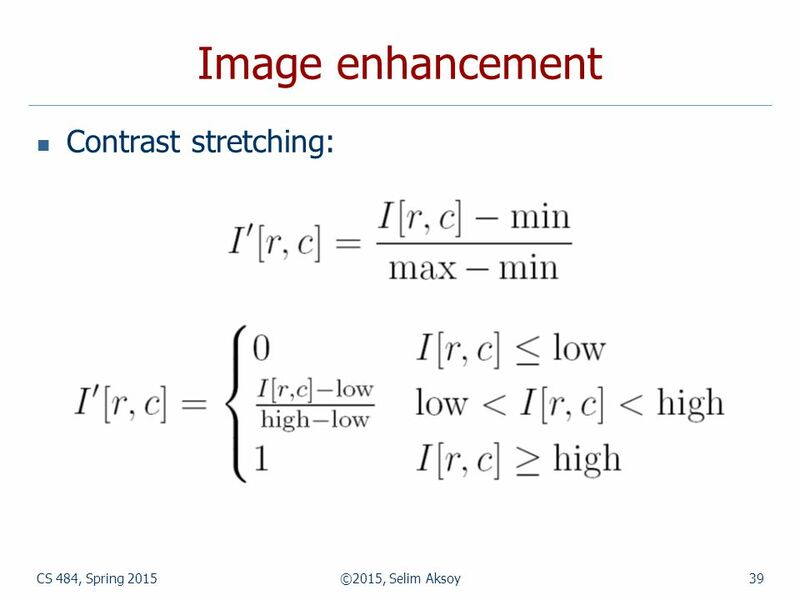 33 CS 484, Spring 2015©2015, Selim Aksoy33 Image enhancement The principal objective of enhancement is to process an image so that the result is more suitable than the original for a specific application. 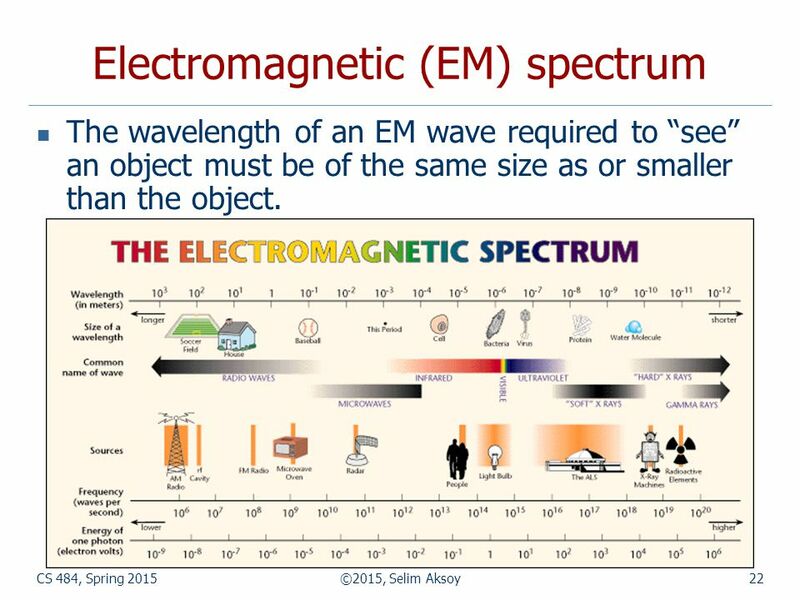 Enhancement can be done in Spatial domain, Frequency domain. 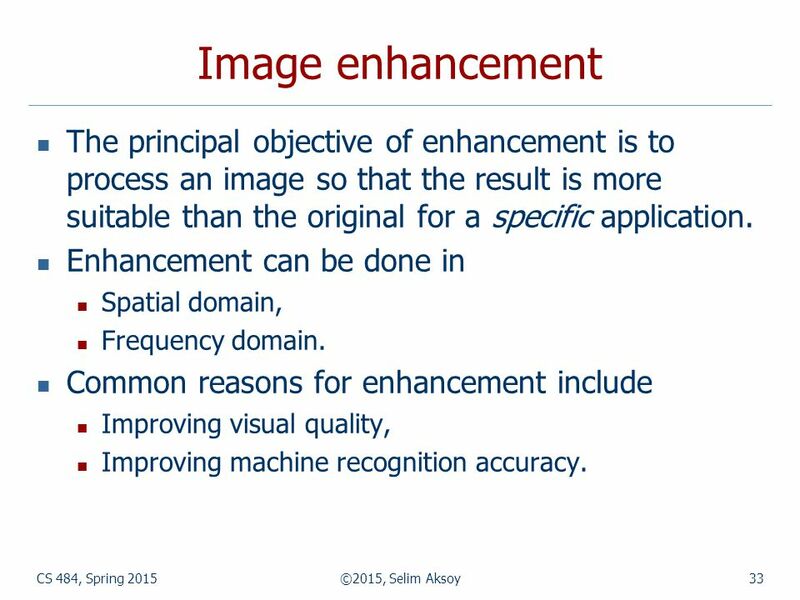 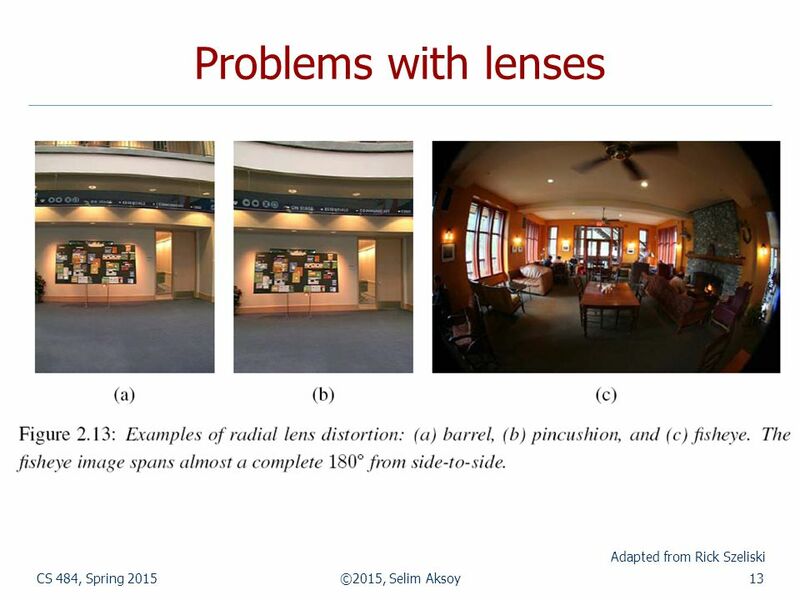 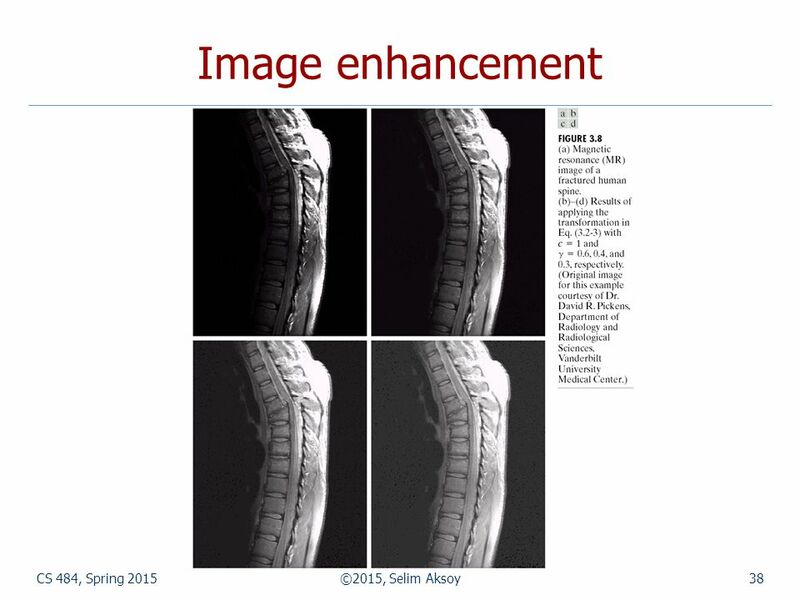 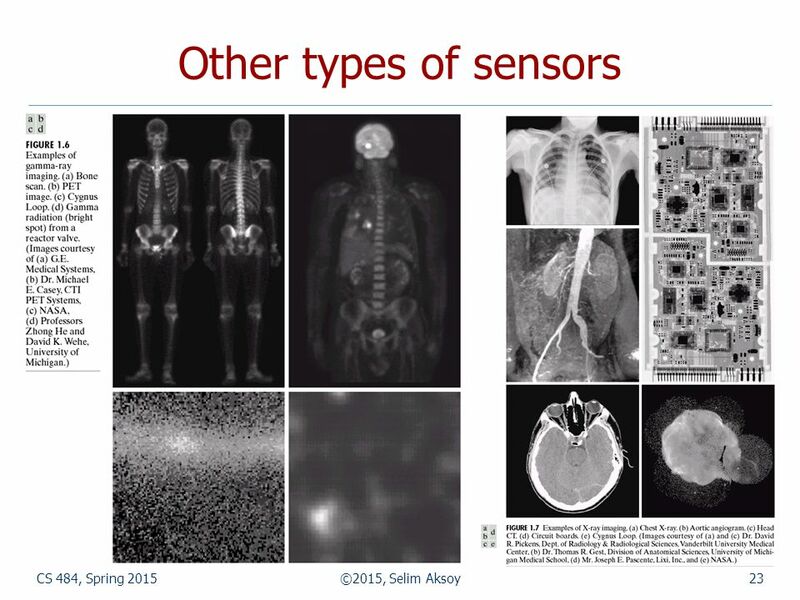 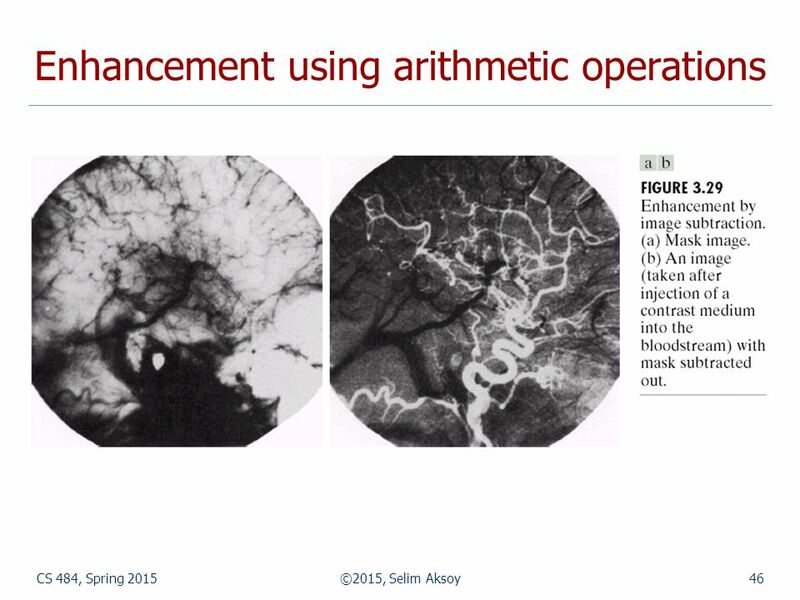 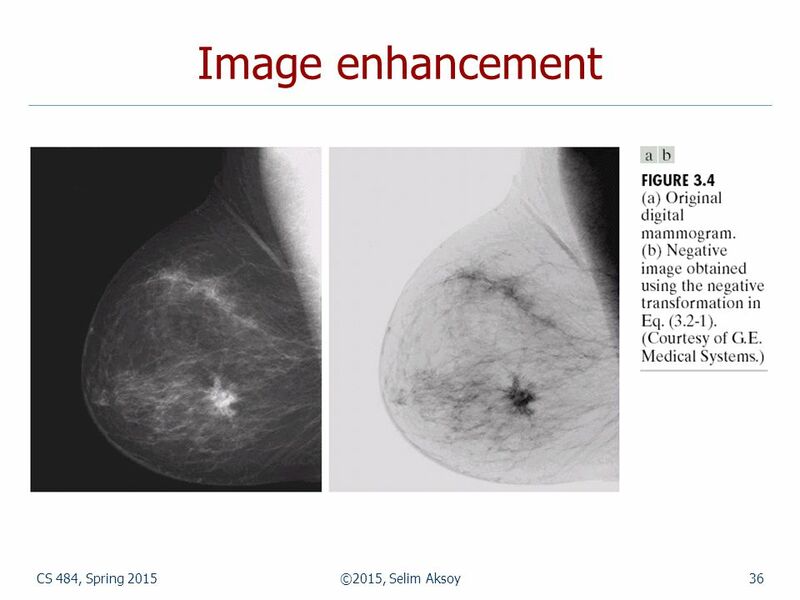 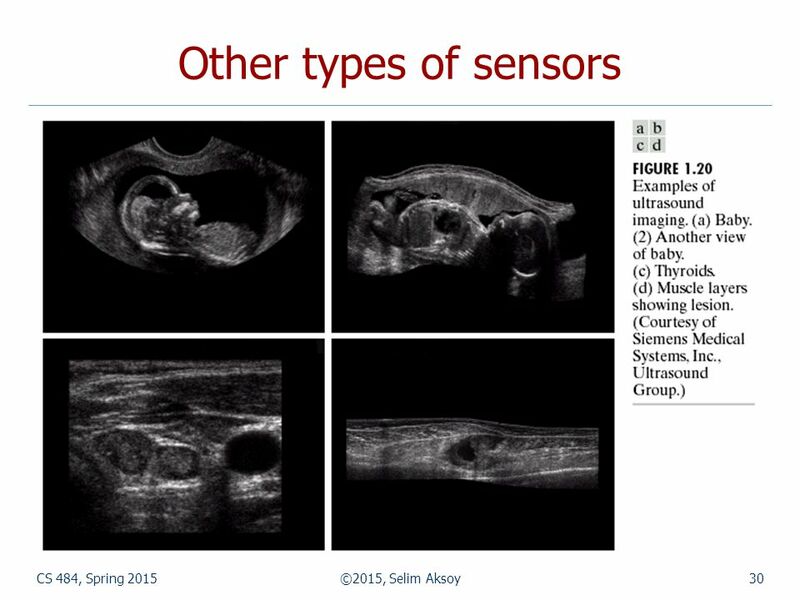 Common reasons for enhancement include Improving visual quality, Improving machine recognition accuracy. 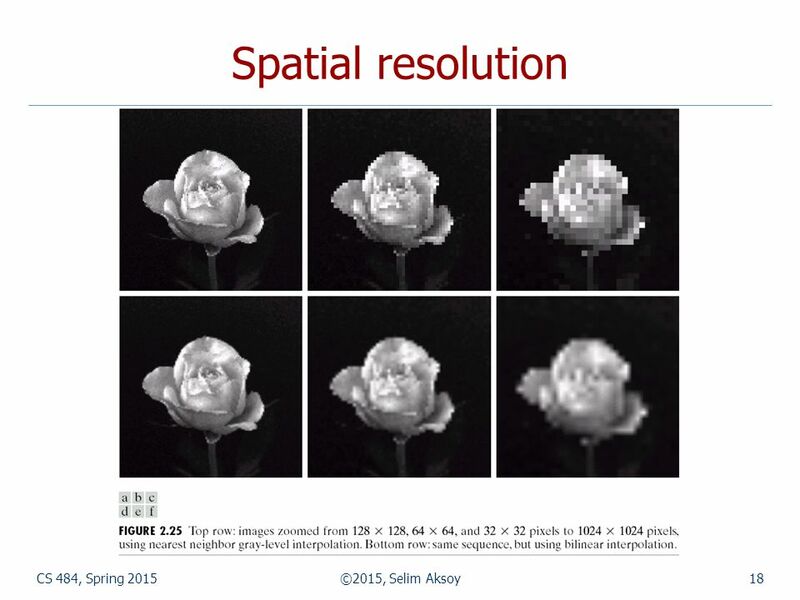 34 CS 484, Spring 2015©2015, Selim Aksoy34 Image enhancement First, we will consider point processing where enhancement at any point depends only on the image value at that point. 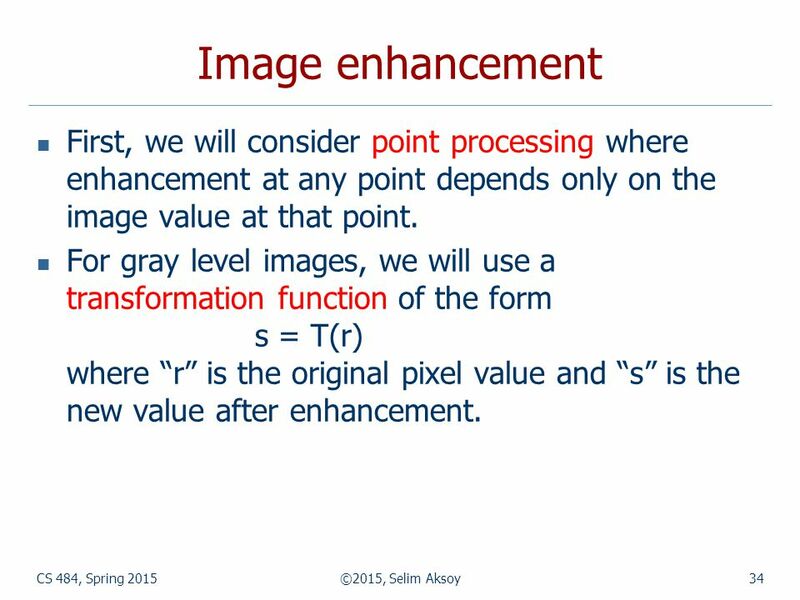 For gray level images, we will use a transformation function of the form s = T(r) where “r” is the original pixel value and “s” is the new value after enhancement. 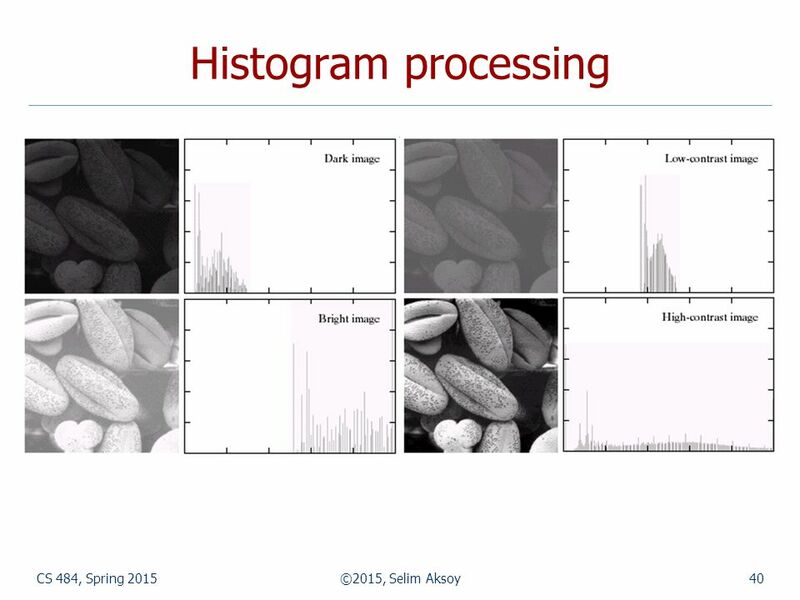 41 CS 484, Spring 2015©2015, Selim Aksoy41 Histogram processing Intuitively, we expect that an image whose pixels tend to occupy the entire range of possible gray levels, tend to be distributed uniformly will have a high contrast and show a great deal of gray level detail. 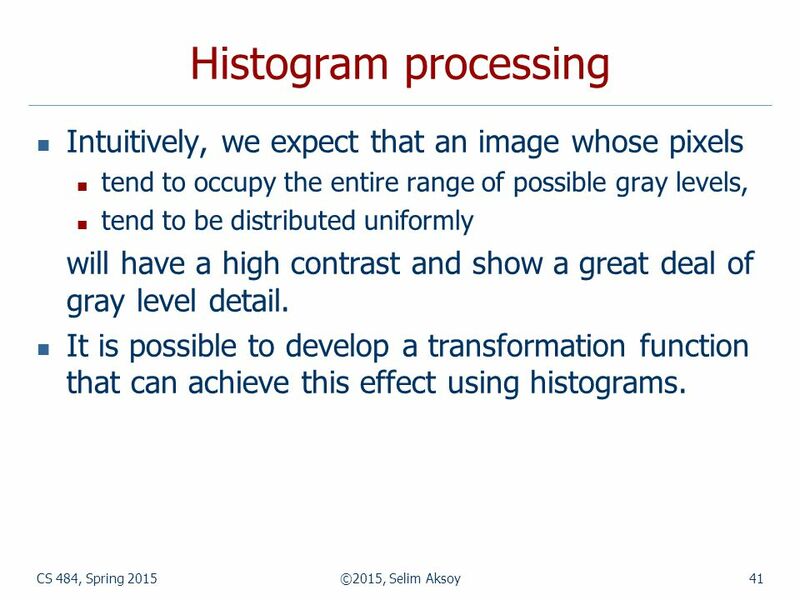 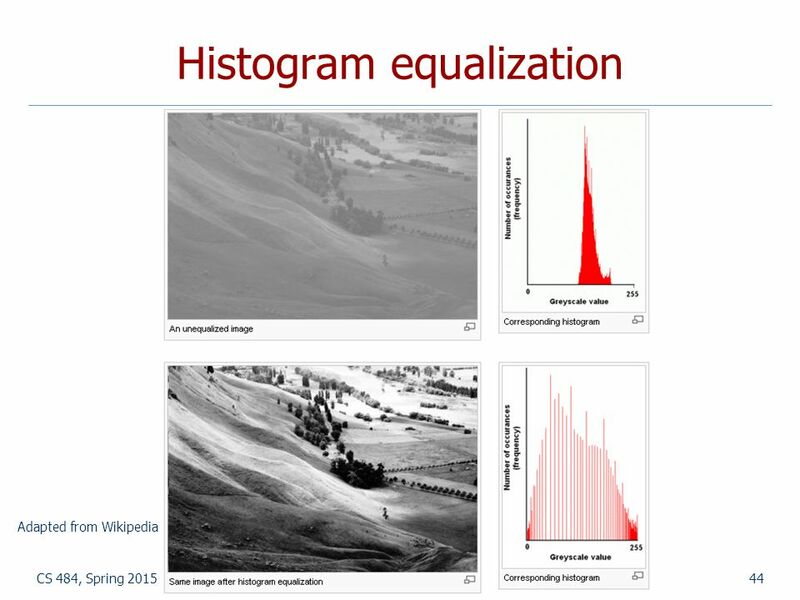 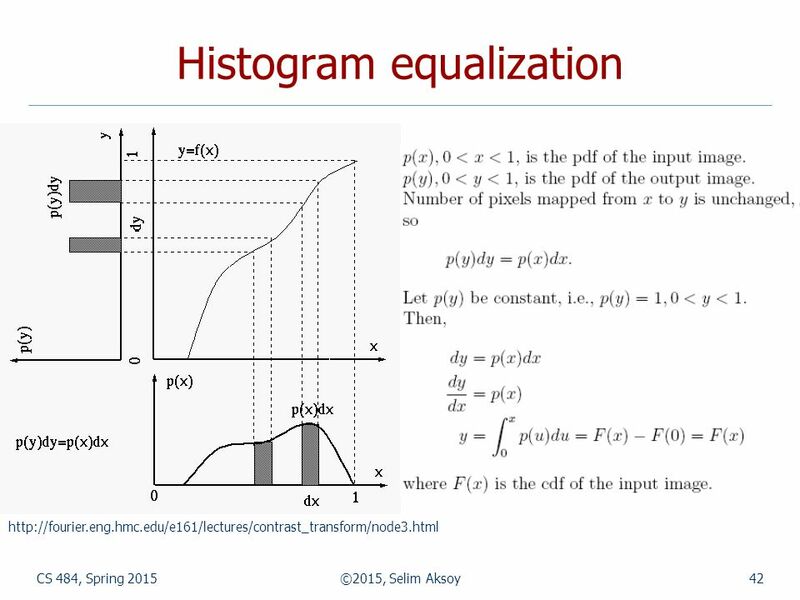 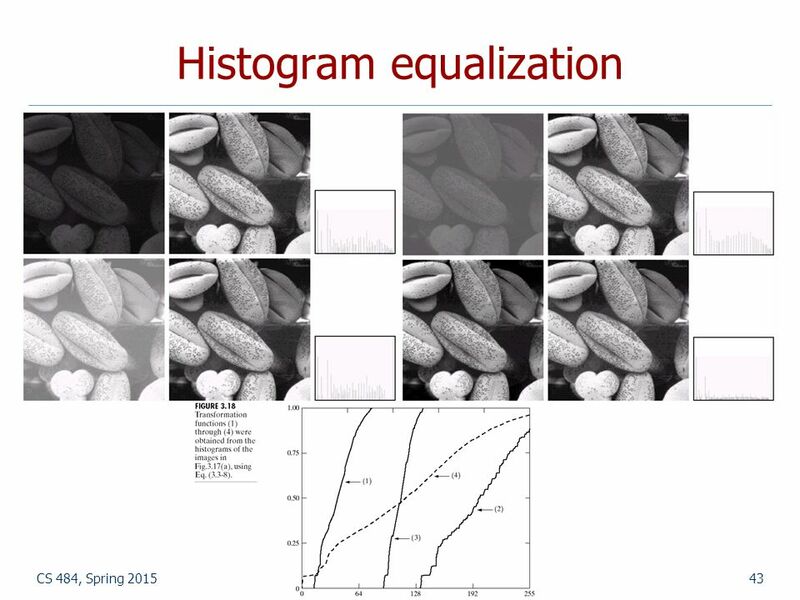 It is possible to develop a transformation function that can achieve this effect using histograms. 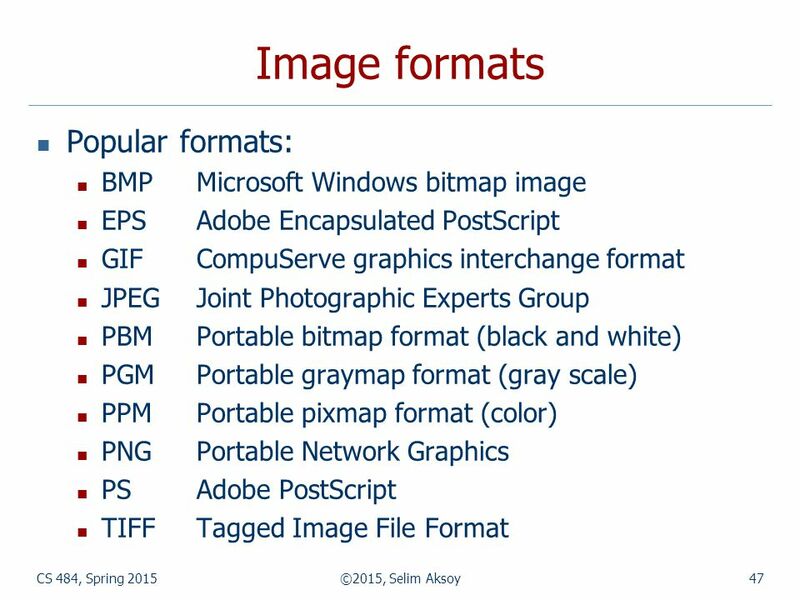 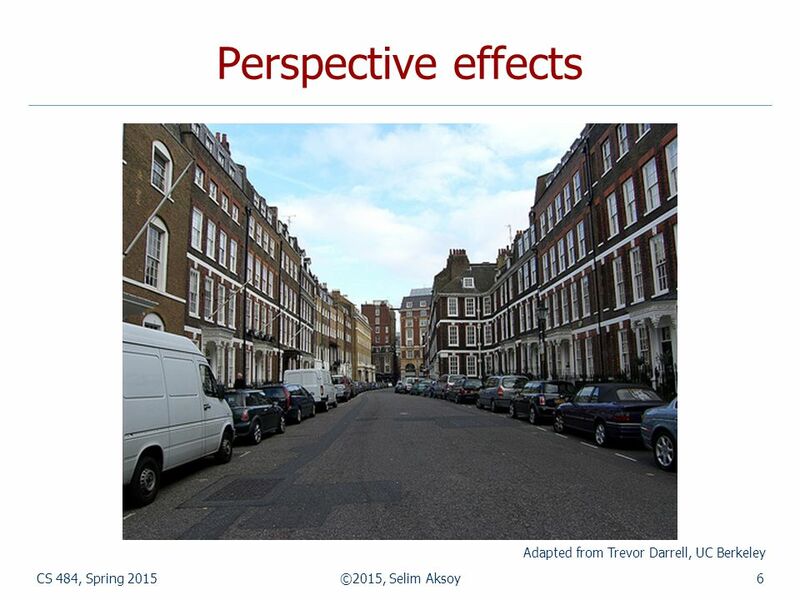 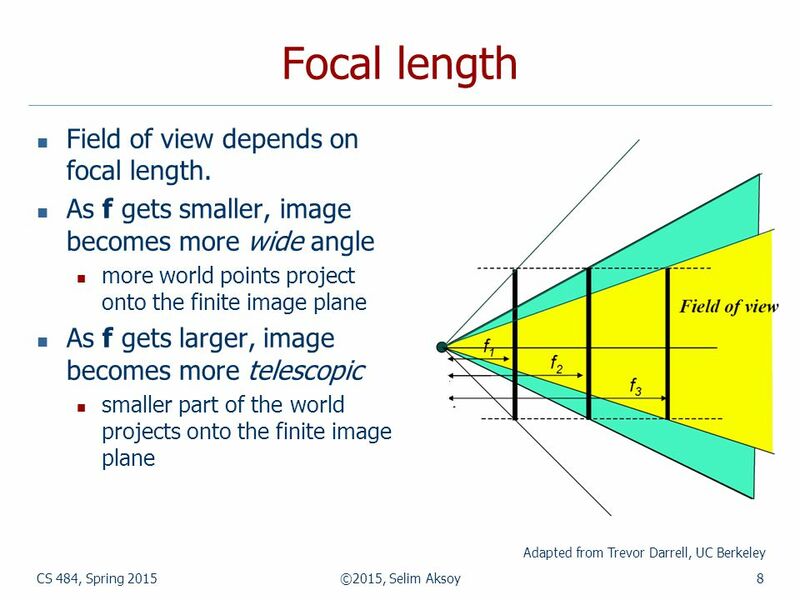 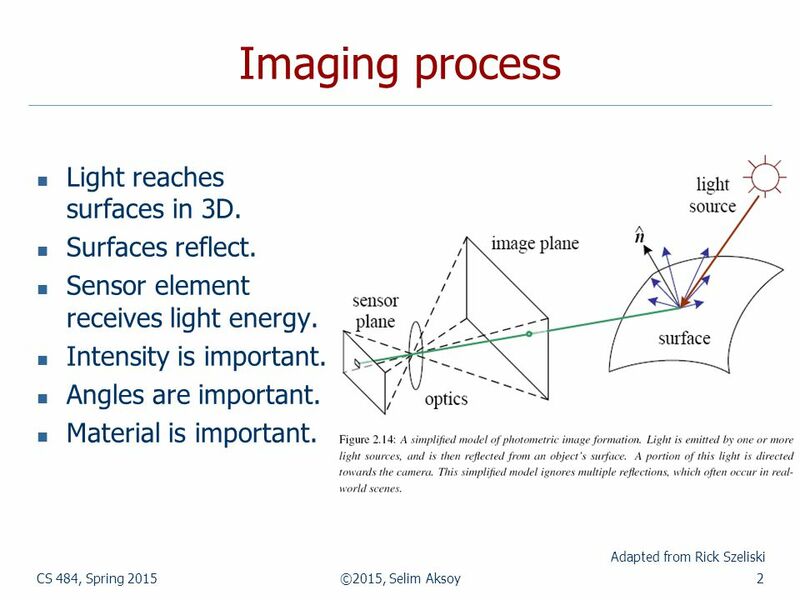 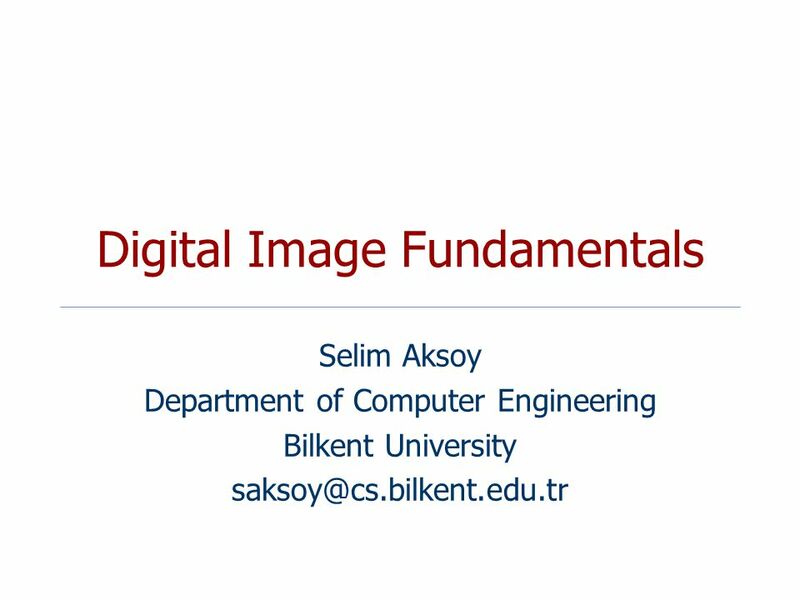 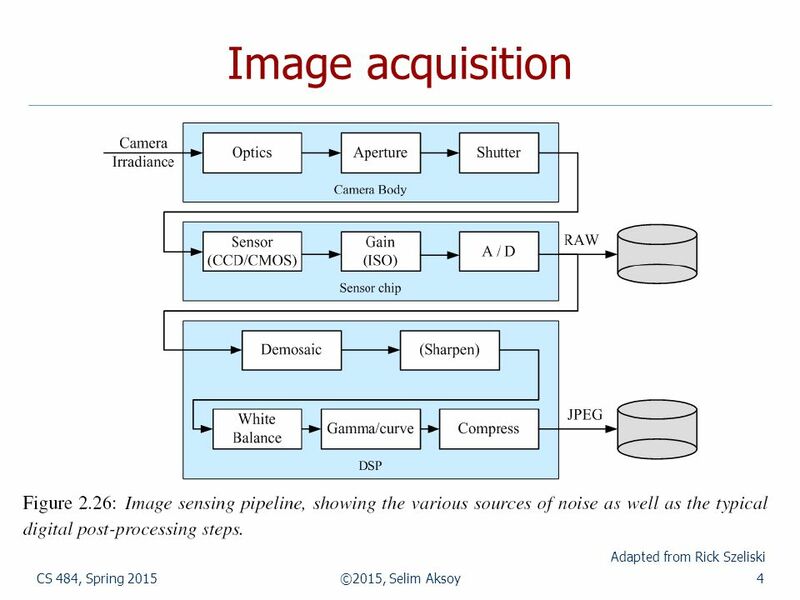 Download ppt "Digital Image Fundamentals Selim Aksoy Department of Computer Engineering Bilkent University"
C280, Computer Vision Prof. Trevor Darrell Lecture 2: Image Formation. 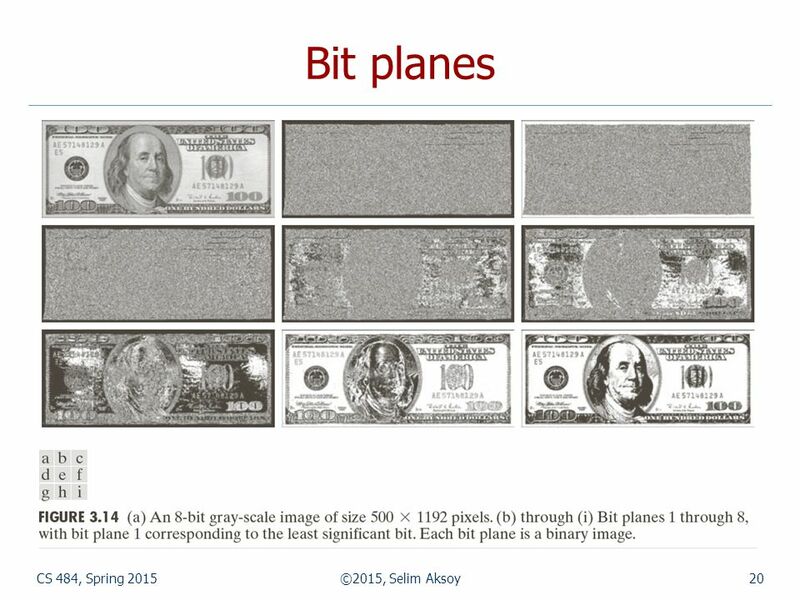 CS Spring 2009 CS 414 – Multimedia Systems Design Lecture 4 – Digital Image Representation Klara Nahrstedt Spring 2009.